Begin Sunday, February 25 by waking your child 15 minutes early. If your child wakes at 7:00 AM, on Sunday, February 25, wake him at 6:45 AM. Tuesday, February 27 shift meals, naps, bedtime and wake time fifteen minutes earlier. Today your child’s wake time will be 6:30 AM. If he was napping 12-2:00 PM he is now napping 11:45-1:45 PM. Wake him if needed. Do not let your child nap fifteen minutes longer. If bedtime was 8:00 PM it is now 7:45 PM. Saturday, March 2 shift bed, nap, wake and meal times another fifteen minutes earlier. Wake time is now 6:15 AM, naptime is 11:30 AM and sleep time is 7:30 PM. Wednesday, March 7 shift bed, nap, wake up and meal times another fifteen minutes earlier. Wake time is now 6:00 AM, naptime is 11:15 AM and sleep time is 7:15 PM. Sunday, March 11 complete the shift. On this day we all will have officially sprung ahead one hour and shifted our clocks accordingly, as a result wake time is back to 7:00 AM according to the clock on the wall. Nap is 12:00 noon and sleep time is 7:00 PM – just as it was before. Thanks to your earlier efforts moving the times in fifteen-minute increments however, instead of losing an entire hour of sleep your child’s body will only have to adjust by fifteen minutes. The sleep deprivation that can fuel those power struggles will be drastically reduced as a result. Monday, March 12 plan to allow your family more time to get out of the house. Even with the proactive steps you have taken, a few extra hugs and a little more help may be needed. Do NOT schedule yourself into any early morning commitments. You’ll be dragging a bit too. 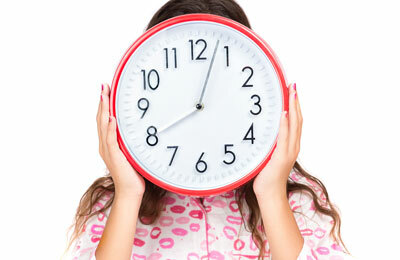 Expect in the next few weeks a few more meltdowns as your child’s body clock catches up with the clock on the wall. It may take several weeks, but ultimately everyone will be back in sync.